After enduring protests that they trivialized the horrors of slavery, by selling 8-inch slave playthings that you could then master for fun, The Weinstein Company has emancipated its controversial line of Django Unchained action figures, asking toymaker NECA to stop boxing up the dolls, effective immediately. As you’ll recall, several groups, including Najee Ali’s Project Islamic Hope and the Rev. Al Sharpton’s National Action Network, recently voiced their dismay over the figurines modeled after the characters of Quentin Tarantino’s revenge fantasy, decrying this seeming commercialization of slavery. (A commercialization of slavery that was just one step over the line, apparently, seeing as even Ali said, “I actually enjoyed the movie.”) They then called for a nationwide boycott of the dolls. Naturally, almost of all of them sold out immediately. Take that, commercialization. Aside from helping slave doll-owners grow exceedingly rich by stocking their action figure fields with instant collectors’ items, the protesters also received reparations in the form of a sort-of-apology from the Weinsteins’ publicist, easily the best kind of reparations. 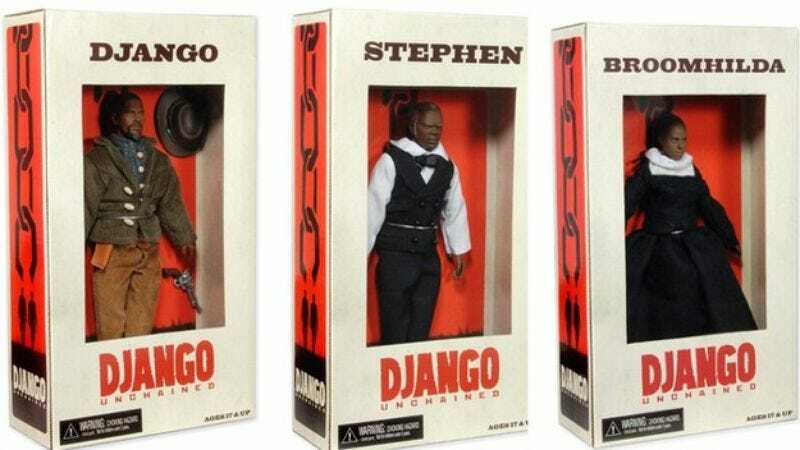 “We have tremendous respect for the audience and it was never our intent to offend anyone,” the statement reads, before pointing out that the Django Unchained toys were meant for the same 17-and-older audience as the film, just like the similar collectibles NECA had produced for Tarantino’s other movies such as Reservoir Dogs and Inglourious Basterds. Those dolls, as of press time, have yet to be freed.